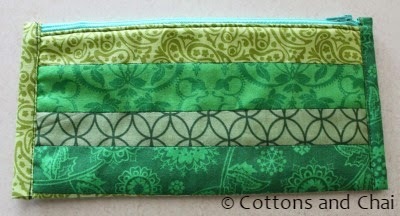 Cottons & Chai: Quilted Pouches - A vote of thanks! My toddler son and I are best buddies. We spend almost all of our time together. When I'm in the kitchen, he's right there getting into pots and pans with me. When I'm working on my laptop he's sitting next to me doing some 'important work' on his. When I'm in the bathroom, he's outside chatting away through the door. You're starting to get the picture here - although the real umbilical cord has long been cut, I sometimes feel an invisible cord still holding us together. You can imagine then how difficult it must have been for him when he started day care a few months ago. What really helped him get through this tough stage was the kindness, care and patience shown by his teachers. So when I pulled him out of school on account of our long vacation, I wanted to make his teachers each a thoughtful and useful gift as a token of my gratitude. While I was thinking of how to also make it personalized I spied a little chart in their classroom that gave a bit of information about the teachers, including their favorite colors. That was it! 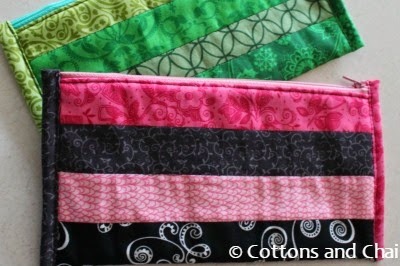 I decided to make them quilted pouches (pouches because they have a thousand uses, everyone needs them!) in the colors they liked - Green and Pink,Black. 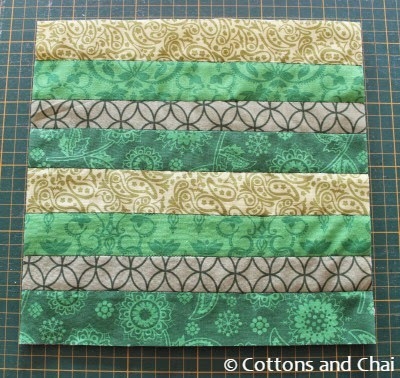 I wanted to make the quilting more interesting by using different shades/ prints of the color. 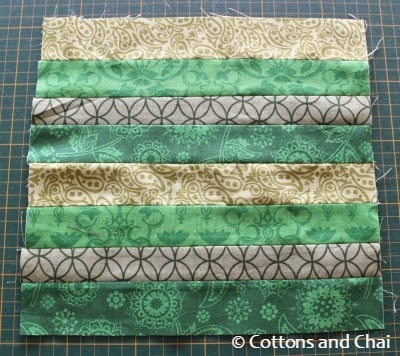 So I started with different strips of green of the same size. I sewed them together with a 1/4" seam allowance and pressed the seams open. 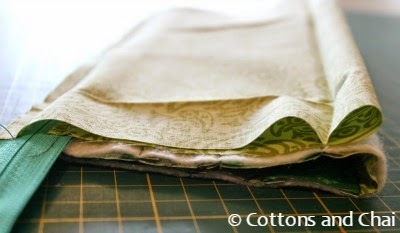 Next I cut a piece of batting slightly larger then the prepared piece and quilted the two layers together through each seam. 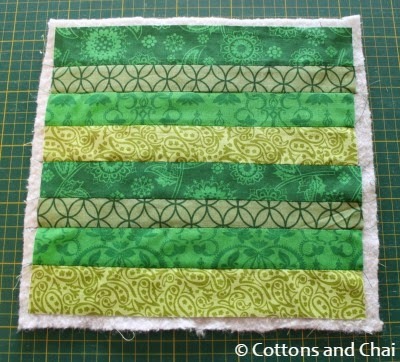 Then I trimmed the quilted piece to the desired size. 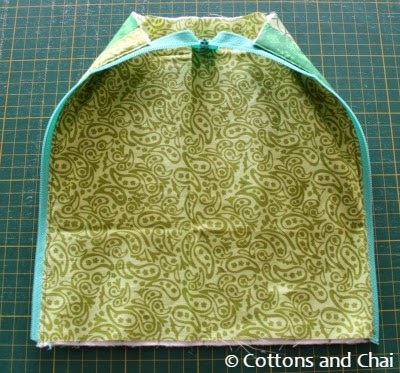 I then sandwiched a zipper between the quilted piece and lining fabric and sewed it together. 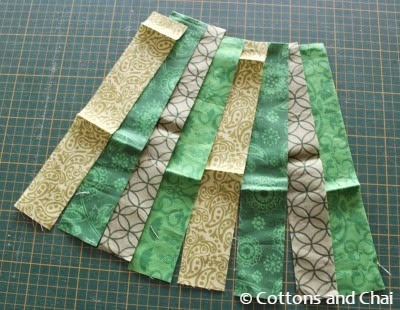 I repeated these steps to attach the other side of the zipper to the opposite side of the quilted fabric and lining. And here's how it looked at this point once the zipper was opened up. 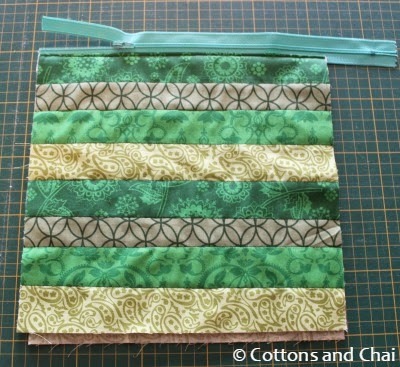 I cut two more strips of fabric to make the piped sides that also closed up the pouch. My first quilted pouch is ready! And here's the other one in shades of pink and black. When my son's teacher unwrapped her present, she was so surprised that it was in her favorite colors. "How did you know?!" she exclaimed. When I pointed to the little chart she gave me a hug and said how thoughtful it was that I noticed. Well, it was nothing compared to the love and kindness they had extended, but I hoped it would go a little way in showing my thanks and appreciation. Aww- this is very sweet! Love the pouches. Too cute. These lil heart felt deeds go a long way..everyone loves personalized gifts. V thoughtful n creative. How thoughtful of you to make the pouches in their favorite colors! 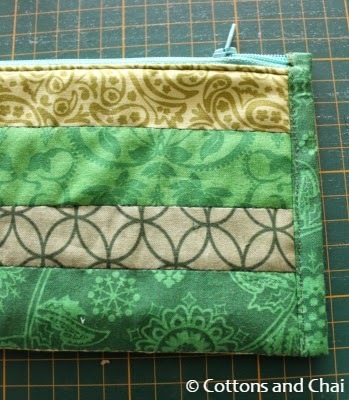 The quilting on the pouch makes it look extra special. Loved it!